Brandon Ballengée might not be someone you think of as a performance artist. But his works are artifacts of performative actions, works that often cannot be completed without the effort of a team of individuals, collecting specimens and data, recording experiences, sharing their stories. The result of this data-gathering and collective storytelling are currently on display at the Ronald Feldman Gallery in Ballengée’s show Collapse: The Cry of Silent Forms (on display until June 30th). The show is a collection of eerie, fascinating, beautiful and haunting images that speak to the complexity and slow destruction of our environment. Since the BP Deepwater Horizon Oil spill of 2010, Some species in the Gulf of Mexico have been showing strange deformities: eyeless shrimp, fish with lesions. Eyeless baby dolphins have even washed up onshore. 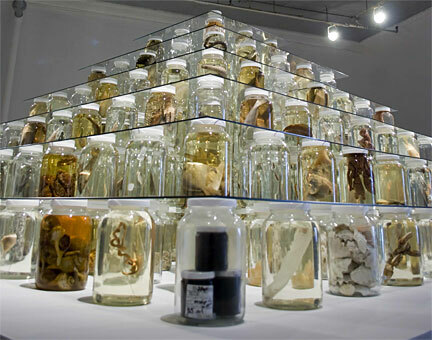 In Collapse, these specimens from the gulf in are on display in large jars, arranged in a pyramid by trophic layer– bottom feeders, plants and tar balls on the bottom, larger species higher up on the food chain higher up on the pyramid, with empty jars placed occasionally to signify extinct or forgotten species. These specimens are an answer to a call put out by Ballengée for examples of the aftermath of the gulf. The response was overwhelming– photos and organisms forwarded on by scientists, shrimpers, and various activist citizens, many who wandered into restricted areas to obtain their specimens. Co-authors of the piece include Aurore Ballengée, Phillip Henken, Mike Madden and Gillian Wilson, who collected specimens form individuals as well as New York fish markets. “It’s a sculptural expression of the complexity of the issue, and also the complexity of the food chain itself,” said Ballengée in an interview. The current suspect of the deformities is corexit, the chemical dispersant used widely– likely to excess– by BP during gulf cleanup. Visitors to the current show at the Ronald Feldman Gallery are initially confronted by a looping video of BP advertisements– glossy celebrations of gulf culture and cuisine, images of pristine beacheads and local gumbo– barrelled through with rolling statistics and narrative on actual BP cleanup and ecological disaster. “Really the intention with the whole first part of the show is to try to get the local populous to realize what’s still happening, and hopefully that could effectively reach media, and then through media and popular support push for governmental reform and, you know, real pressure on BP to try to either do better restoration efforts, honest restoration efforts, and then to allow for research to see what’s been actually happening,” said Ballengée. The Collapse team has heard stories from scientists who couldn’t get access to areas they wanted to research, and from citizens who brought tar balls to congressional hearings. Another major work in the show, Malamp, has been ongoing for Ballengée for a number of years. In it, he collects deformed amphibians onsite with volunteers, sorting though piles of live baby frogs and pulling the ones that are so maligned– limbless, pelvic-less, sprouting eight back legs– that they will not survive on their own. Ballengée describes standing and pawing through wetlands with groups of artists, scientists and concerned citizens just sobbing over the malformed and tiny amphibians. The artist goes to lengths to train participants in accurate data-collection, but it’s difficult to emotionally prepare someone for the sight of hundreds of tiny deformed frogs. The selected frogs are painlessly killed, then cleared and stained in a chemical process that removes skin and muscle and dyes bone and cartilage.This process actually help scientists identify what parts of a tiny amphibian might be malforming, which then helps determine the cause of the deformity. Chemical pollution was an initial suspect, but the deformaties have since been traced to trematode parasites. Still, our chemical impact on the environment can not be ruled out entirely– in wetlands that have become nutrified due to increased chemical runoff, there is an increased population of the culprit parasite. The resulting installation artworks for Malamp include glowing petri-dishes, lit from below to illuminate tiny blue-and red skeletons, as well as giant watercolor prints of the skeletons. Each eerie frog-remnant develops its own character, its own presence, despite being a lifeless form. Ballengée’s work is not something you’d see on a stage, but performance is inherent in the work. Performance as ecological action, performance as activism, performance as collective collecting. It leaves one to wonder: to what extent must nature perform death, perform imbalance, perform the deformed, in order for its health to become a regular part of our cultural dialogue? Tagged with: activism, bp oil spill, brandon ballengee, collapse, deep water horizon, ecological art, gulf spiil, pollution, Responses, ronald feldman gallery, sculpture.